This article gives a brief overview of the thyroid and parathyroid glands and the hormones that they make. Both the thyroid and parathyroid glands are endocrine glands. This means they make and secrete (release) hormones. Hormones are chemicals which can be released into the bloodstream. They act as messengers, affecting cells and tissues in distant parts of your body. Thyroid hormones affect the body's metabolic rate and the levels of certain minerals in the blood. The hormone produced by the parathyroid also helps to control the amount of these essential minerals. Where is the thyroid found? 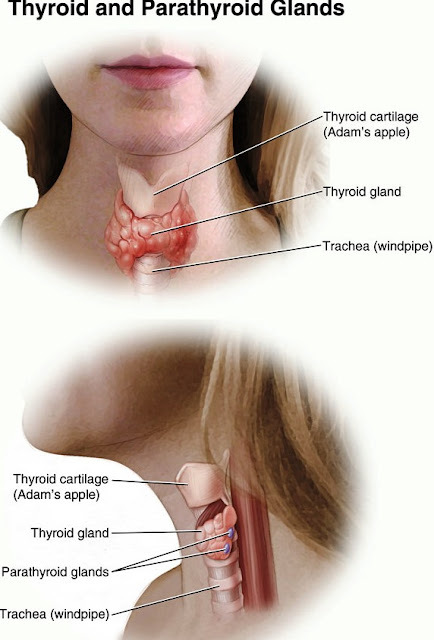 The thyroid gland is found in the front part of your neck, just below the large cartilage tissue in your neck (your 'Adam's apple'). It is made up of two lobes - the right and the left lobes. These two lobes are joined by a small bridge of thyroid tissue called the isthmus. The two lobes lie on either side of your trachea (windpipe). The thyroid makes three hormones that it secretes into the bloodstream. Two of these hormones, called thyroxine (T4) and triiodothyronine (T3), increase your body's metabolic rate. Essentially the body's metabolic rate is how quickly the cells in your body use the energy stored within them. Thyroid hormones make cells use more energy. By controlling how much energy our cells use, thyroid hormones also help to regulate our body temperature. Heat is released when energy is used, increasing our body temperature. Thyroid hormones also play a role in making proteins, the building blocks of the body's cells. They also increase the use of the body's fat and glucose stores. In order to make T3 and T4 the thyroid gland needs iodine, a substance found in the food we eat. T4 is called this because it contains four atoms of iodine. T3 contains three atoms of iodine. In the cells and tissues of the body most T4 is converted to T3. T3 is the more active hormone, it influences the activity of all the cells and tissues of your body. The activity of the thyroid is controlled by hormones produced by two parts of the brain, the hypothalamus and the pituitary. The hypothalamus receives input from the body about the state of many different bodily functions. When the hypothalamus senses levels of T3 and T4 are low, or that the body's metabolic rate is low, it releases a hormone called thyrotropin-releasing hormone (TRH). TRH travels to the pituitary via the connecting blood vessels. TRH stimulates the pituitary to secrete thyroid-stimulating hormone (TSH). TSH is released from the pituitary into the bloodstream and travels to the thyroid gland. Here TSH causes cells within the thyroid to make more T3 and T4. T3 and T4 are then released into the bloodstream where they increase metabolic activity in the body's cells. High levels of T3 stop the hypothalamus and pituitary from secreting more of their hormones. In turn this stops the thyroid producing T3 and T4. This system ensures that T3 and T4 should only be made when their levels are too low. Calcitonin is released by the thyroid gland if the amount of calcium in the bloodstream is high. Calcitonin decreases the amount of calcium and phosphorus in the blood. It does this by slowing the activity of cells found in bone, called osteoclasts. These cells cause calcium to be released as they 'clean' bone. Calcitonin also accelerates the amount of calcium and phosphorus taken up by bone. Calcitonin works with parathyroid hormone to regulate calcium levels (see below for full explanation). Where are the parathyroid glands found? It causes calcium to be absorbed (taken up into the blood) from the intestine. It stops the kidneys from excreting (getting rid of) calcium in the urine. Normally, parathyroid hormone release is triggered when the level of calcium in the blood is low. When the calcium level rises and is back to normal, the release of parathyroid hormone from the parathyroids is suppressed. However, parathyroid hormone and calcitonin work together to control calcium levels in the blood. The blood calcium level is the main stimulus for the release of these hormones, as the release of these hormones is not controlled by the pituitary. Parathyroid hormone also acts on the kidneys. Here it slows down the amount of calcium and magnesium filtered from the blood into the urine. Parathyroid hormone also stimulates the kidneys to make calcitriol, the active form of vitamin D. Calcitriol helps to increase the amount of calcium, magnesium and phosphorus absorbed from your intestines (guts) into the blood.